Ancient Instruments for a Modern World! What is a Native American Flute? First of all, it is not a Japanese flute. It is also not an Indonesian flute. 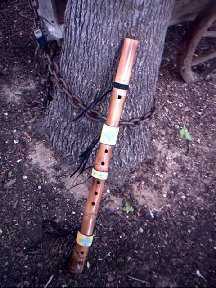 It is not a Mayan flute, although a Mayan flute is Native American. It is not a guitar, sitar, or grand piano. It is a flute made in the totally unique way of the Indigenous Peoples of the North American continent. It can be made by a Japanese American, Indonesian American, Mayan American, Mexican American, African American, Oriental American, White American, or anyone else who has a mind to make one - even a Native American! The name Native American Flute no more implies that the instrument was made by a Native American than the term Japanese flute implies that the instrument was made by a Japanese person, or that a Mayan Flute was made by a Mayan. It is simply the style of flute! I am not a member of a recognized band of Cherokee! To our Government, that means I am not Cherokee. Click picture to hear clip and purchase! Click on banner to visit Bob's website! Man Wolf's work is dedicated the the Native American Flute, and the Indigenous peoples of the Americas that brought the flute into existence! Man Wolf has made his living with the Native American Flute for some fifteen years now, and feels it to be his obligation to honor the instrument, and the People by making his flutes as close to tradition as possible. 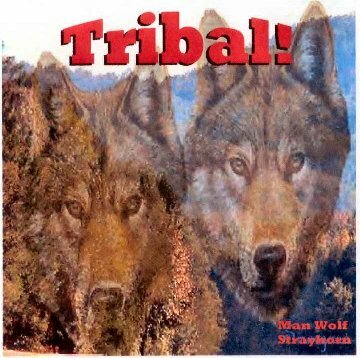 Send mail to manwolf@spiritways.org with questions or comments about this web site.